All you have to do is share with us a screenshot of your post battle results or a video showing us your best World of Tanks Console game with any tank from any nationality! 1 Lucky winner will receive the autographed poster and a Primo Victoria tank with all Sabaton crew members! You have until March 31st 12:00PM Central time to participate! Edited by RaiBOT01, 05 April 2018 - 09:36 PM. Nice, Older Videos are allowed? 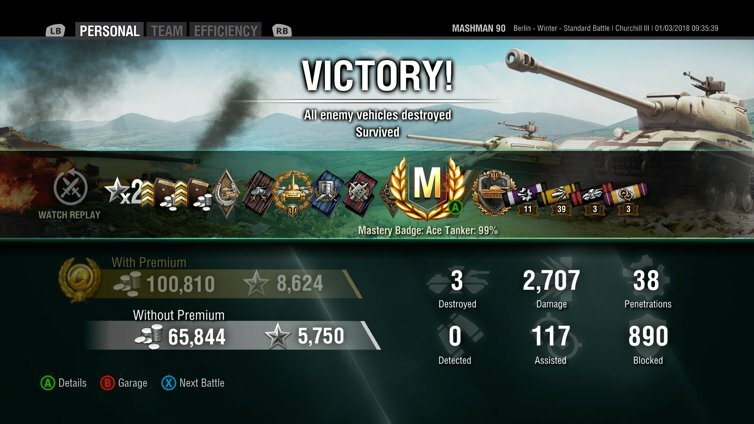 Took me over a year to finally get Ace Tanker in my baby. best game I ever had. Probably will take lightyears to have such a game again. 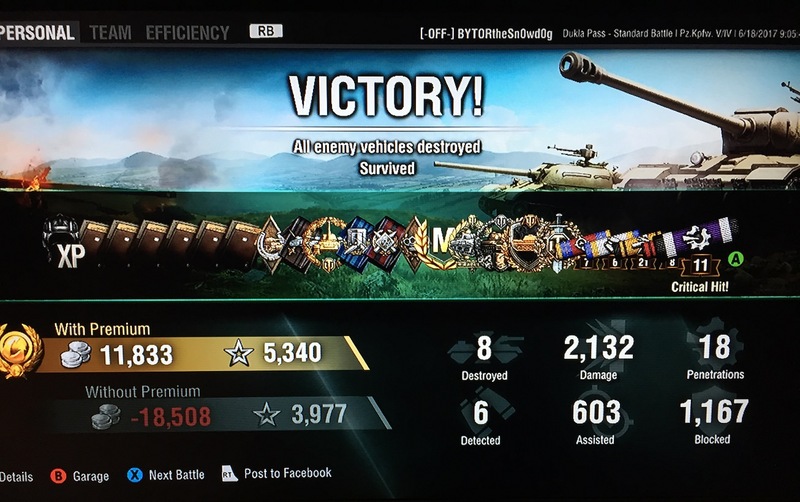 In case I win, could you please credit the tank and crews to my fellow tanker "xDERDE" ? Awesome prize. Maybe i can get lucky. Sorry for the link but I don't know how to embed the images. This is the best game I've had in a year which funnily enough was my very first battle in the obj 263 today. So, this isn’t my best game ever, but it’s my best recent game and one I’m very proud of. 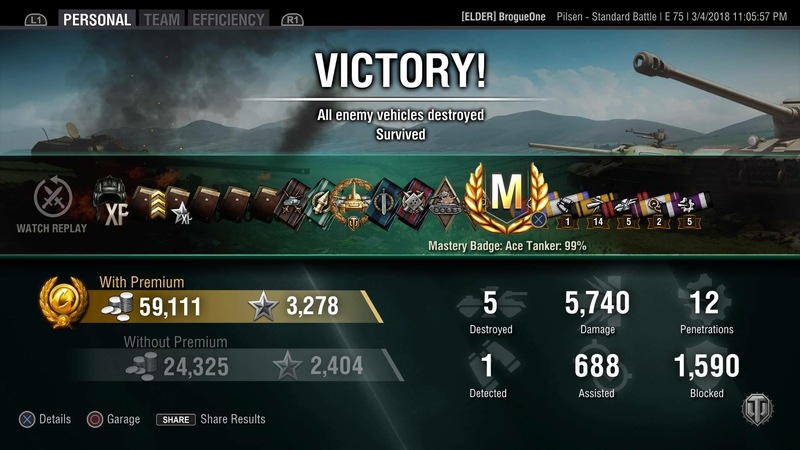 While competing for Germany during Tank Madness I got this Ace Tanker game in my E75! It was a difficult tank for me at first and I struggled until I got fully upgraded. There’s a lot of very good players in the E75 and I’m very proud to have broken into that bracket! Edited by bball-swag163, 09 March 2018 - 05:23 PM. 3 Marked: T-54 ltwt, Ru 251, LTTB, Leopard 1, WZ-120, Leopard PTA, T-34-2, STA-1, M26 Pershing, Sherman Fury, M4A3E2 Sherman Jumbo, T-10, ST-I, KV-4, T30. 2 Marked: AMX 13 90, Hollenhund, T71 DA, Spahpanzer I C, LTG, Skoda T 50, T-54, T54E1, M46 Patton, E50, AMX 30 proto, T-44, Panther 2, M4A1 ravioli, Type 5 Chi-Ri, T-43, T-34-1, T20, Panther, T-34(tier 5), E 100, Type 4 Heavy, M103, E-75, Conqueror, T32, T29, FV215b(183), Waffentrager auf Pz. IV, Tortoise, T28 Proto, Rhm.- Borsig Waffentrager, Skorpion G, ISU 152, AT 15, T25/2, SU 152. 1 Marked: WZ-132, WZ-131, Lycan T71, AMX 13 75, VK 28.01, Type 64, T21, MT-25, Cromwell Snakebite, AMX 12 t, VK 16.02 Leopard, AMX ELC bis, T37, M48A1 Patton, Centurion Action X, Batchat 25 t, Type 61, Centurion 7/1, Batchat 25 t AP, TVP VTU, T69, Centurion 1, T-34/100, Comet, Skoda T25, VK 30.02 M, Type 58, T-34-85, Cromwell, Type T-34, M4 Sherman, T110E5, Chieftain mk.6. VK 45.02 (P) ausf. A, Tiger 2, O-HO, IS-3, Caernarvon, Tiger 1 Hammer, Tiger 1, O-NI, KV-3, IS, Black Prince, VK 36.01 (H), T-150, O-I, VK 30.01 (H), T110E4, Jagdpanzer E 100, Grille 15, Object 704, Jagdtiger, UDES 03, Ferdinand, St Emil, Jagdpanther, AT 7, M18 Hellcat, Jagpanzer IV, Ikv 65 Alt II, AT 8, M53/M55, BC 155 55, M40/M43, Lorraine 155 mle.51, M12, Lorraine 155 mle.50. All of your scores are making me feel bad about my own skills LOL!!!! had that feeling earlier before i had a string of decent games in Revalorise, had 4 points in 5 battles for France using Pak 40, Lefur and Revalorise and thought picking France was hell but rather do that than pay 500-600,000 Silver for OI Experimental, to sell it after. Nothing but awesome in this page! Game Community → English Speaking Community → Forum → General Discussion → Tank Discussion → Swedish Vehicles → a unimportant question!